While perusing a local bodega in the city, I ran across a new flavor of sunflower seed. The Southerner in me was instantly draw to them. 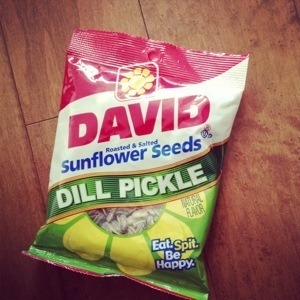 I mean, Dill Pickles + sunflower seeds?!?! What an amazing combination….a delicacy in which to behold and delight! However, my sophisticated New York transplant alter ego questioned the ratchetness of this snack. While some might deem this flavor of sunflower seeds as being “country as hell”, I ultimately decided to try them, and was very pleased. So, what say you friends? Are dill flavored sunflower seeds ratchet or refined?